Since turkeys are birds, hunting them must qualify as “bird hunting” but if you ask me its much more like hunting big game. Head-to-toe in camo you sneak into the woods, sit perfectly still and then when you get a tom in range you shoot him in the face with a shotgun. No flushing coveys, no dogs, no talking. Just like deer hunting except the spring weather is beautiful and later you get to de-tick your balls. Joking aside, hunting turkeys is a blast. Being in the woods at day break holds its own magic – song birds erupt, a distant maniacal yelping of a coyote pack, the ungraceful crashing of a turkey flock coming off the roost and then the stirring, booming gobble of a courting tom. Exciting stuff. Here is a Texas Rio Grande Tom, bizarre but beautifully iridescent. 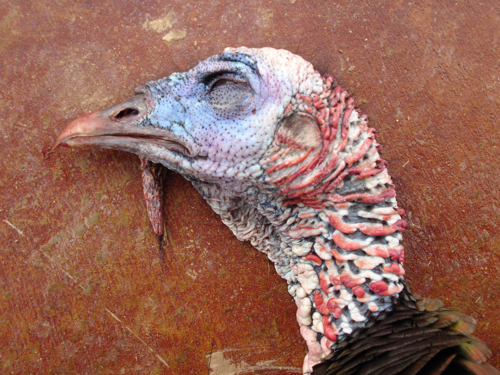 Talk to Mike Wyatt at First Shot Outfitters for a terrific Texas turkey hunt.